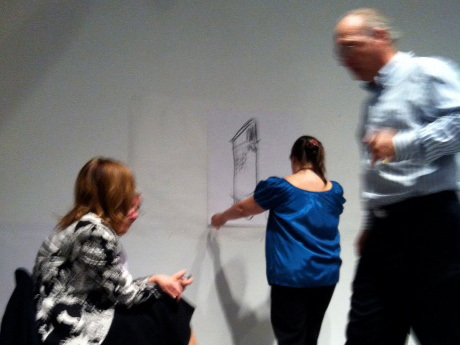 The Center for Architecture Foundation (CFAF) hosted its first annual Guess-A-Sketch Tournament on 22-May, 2012 at the Center for Architecture, home to the American Institute of Architects NY. 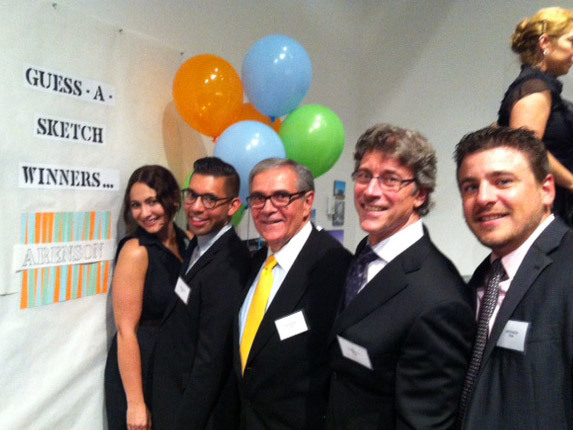 It was a fundraiser for CFAF’s program to advance public awareness and a broader appreciation of the built environment through education programs for kids and adults at the Center for Architecture and in schools around New York City. Nine sponsor teams competed against one another to guess the identities of architecturally significant buildings depicted in the very impromptu charcoal drawings created by four designer superstars: Hugh Hardy, founding partner of H3 Hardy Collaboration Architecture; Charles Renfro, a partner at Diller Scofidio and Renfro; Ronnette Riley, founding principal of Ronnette Riley Architect; and Robert M. Rogers, founding partner of Rogers Marvel Architects. CFAF tapped the recently retired Vice Chairman Emeritus of Gensler Walter A. Hunt as Master of Ceremonies. The sponsor teams, each composed of 5 team members, included Arenson Office Furnishings, Knoll, Studios Architecture, Sciame, Turner Construction, Gensler, Perkins Eastman, Robert Silman Associates, and Cerami Associates. The victor was Team Arenson, made up by Carl Milianta, President, Leo Alessi, Director, Adrian Parra, Marketing Director, Christa Adymy and Gary Wilkin, both Account Executives. In the first round, Arenson vanquished Gensler and Perkins Eastman by correctly guessing drawings of Notre Dame Cathedral and the Flatiron Building. Having advanced to the second round, the Arenson Team correctly guessed drawings of the British Museum and Mont Saint-Michel, thereby eliminating Sciame and Cerami Associates.